As I mentioned the other day, Tank made me late for Reggie's soccer game. I rarely watch an entire soccer game, but that's not the point. Perhaps my need for organization in the kids' bedrooms stems from the current disaster area status of our first floor. 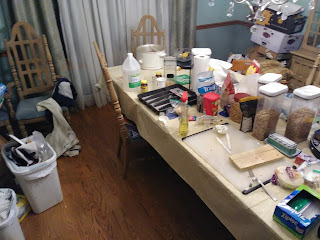 If you read my blog regularly, you know that order is not a standard in our home. Dealing with a small bump out and a kitchen remodel has brought our state of disarray to a whole new level. (even though this level was a choice we knowingly entered). While I am wired to handle chaos and messy surroundings, this kitchen project has tested my tolerance . . . big time. It's been hard to vacuum the kids' rooms lately. The process of dumping clean laundry on the floor and picking thru it as one dresses in the morning has been perfected by my 14 year old son, Tank. Unfortunately, he is not alone. The others cover their tracks better. Once I hound Tank about cleaning his room, he collects the mixture of clean and dirty laundry from the layers on the floor and tosses it unceremoniously into the laundry room. I hate preparing to wash clothes when they are already folded. Believe me, I had plenty of other ways to spend a Saturday morning. At every turn, Tank disappeared from the room. I ordered him back. This task couldn't have been easier for him. I held up items and asked whether it was A, B, or C. In return for my time and effort, Tank rolled around on the floor moaning as if I was preparing to remove his internal organs thru his nose. The thought crossed my mind. Reggie was in their small room sorting his own clothes at the same time. 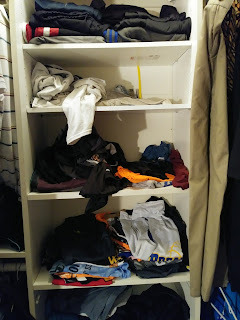 This may not have been the most well planned organizational system ever, but I was hoping the three of us in one space could kill two birds with one stone. Perhaps the word 'kill' is a poor word choice when referring to time spent cleaning up my boys' room. Tank was sitting on the floor looking at his phone. Um, hello? I opened one of Tank's overstuffed drawers. Low and behold, there was Reggie's pile. In an effort to 'be done', Tank had scooped up everything on the floor and stuffed it into his drawer. Right under my nose! And my children wonder why I am a screaming lunatic. Anytime I sent Tank to another room, he failed to return. 'Tank, go put these two sweatshirts in your mudroom locker.' I repeated the direction multiple times. Our house isn't that big, but he did get lost. When Coach and I hollered for him, he claimed he was hanging the sweatshirts in his locker just as he was told. How could that quick task turn into a 15 minute project? tossed on the chair in the upper left corner. Oh, I discovered the answer the next day. Tank had obviously gotten sidetracked by food. A common disorder among teen boys, I suppose. Still- unacceptable! 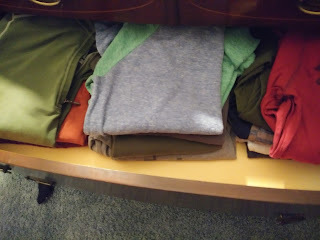 Both sweatshirts were tossed on the floor in a corner of the dining room - where we currently have a mini-kitchen setup due to the construction. They landed no where near his locker. I begged Coach to get in Tank's face. My threats weren't registering. I needed reinforcements. Coach got upset. Tank moved a tad faster. 'Tad' might be too generous a term. Reg wrapped up his portion of the clothes (now that they had been removed from Tank's over-zealous clutches) and raced off to his game with Coach. eventually open his long sleeves drawer. Tank's portion of the job wasn't quite complete when he announced that he needed a ride to the high school. The marching band was attending a performance at a college a few hours away. Last I heard the band members were expected to report to the school at 1:30. It was noon. Apologies for not taking a before pic. messed up, but nothing crazy. . . yet! I could've signed up to have 'reminds' sent to my phone in the form of text messages from the band director. I passed on that opportunity. Tempting as it was. I had no other information to go on. Tank insisted that the band director decided that they needed to leave earlier. Looking back, I probably should've asked to look at the departure change text that he claimed was on his phone. Instead, I dropped Tank off at the high school and headed over to Reggie's game. Late. That night when the bus was incredibly late returning from the band event, a neighbor (not Mary Ann - so many Mary Ann posts, it was hard to choose which to highlight here) texted me. She receives the band 'reminds' and she got a text that the bus was going to be later than anticipated. We owed her a favor, so I offered to bring her son home when we got Tank. That's when I thought to ask her, 'Hey, did the bus really leave around noon today?' Nope. The band bus departed at 1:30 as originally planned. Yep, that's right. My snake of a son would rather sit in an empty school for over an hour than assist me in organizing his closet and drawers. OK, so he's not a snake. He's a dog . . .who loves the doghouse. (As an aside, tonight I picked Tank up from his work on the school's play - he is doing technical stuff. Our conversation made me think that perhaps my blog should be re-titled 'Life with Tank' . . . stay tuned for more Tank stories in the near future). Good Lord, this post triggered my "attempting to make teens help with their own crap" PTSD. I thought only teen girls flopped around on the floor and moaned when asked to do simple tasks! Learn something new every day, I guess..